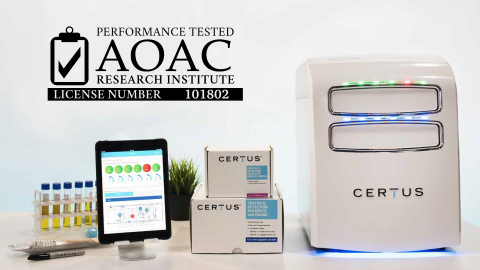 CHICAGO--(BUSINESS WIRE)--CERTUS, innovators in food safety technologies, announces that its CERTUS System for accurate and rapid pathogen detection has achieved AOAC Performance Tested℠ certification (101802). As a result of rigorous validation studies required to achieve certification, AOAC validation provides small- to mid-sized food processing plants further assurance on the reliability and efficiency of CERTUS’s in-house environmental Listeria monitoring process, a simple, safe, and cost-effective way to deliver swab-to-result pathogen detection. The CERTUS System for accurate and rapid pathogen detection has achieved AOAC Performance Tested certification (101802).